Go to the Articulate tab on the PowerPoint ribbon, and click Slide Properties. When the Slide Properties window opens, click Library in the lower left corner. When the Library opens, select the Playlists tab on the left side of the window. Enter a name for your new playlist, and click OK. When you first create a new playlist, it'll be empty. See below for instructions on populating a playlist with audio tracks. Create a new playlist, or select an existing one from the Playlist drop-down. Click the Add button on the right side of the window. Select the playlist you want to edit from the Playlist drop-down. Click the Remove button on the right side of the window. 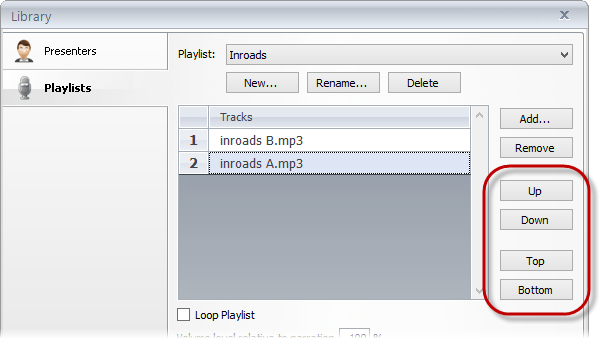 Use the Up, Down, Top, and Bottom buttons to reorder the selected tracks. Mark the Loop Playlist box below the list of tracks. Enter a percentage in the Volume level relative to narration field at the bottom of the window. For example, if you want your background music (playlist) to be half as loud as your course narration, enter 50. Enter a new name, and click OK. Select the playlist you want to delete from the Playlist drop-down. 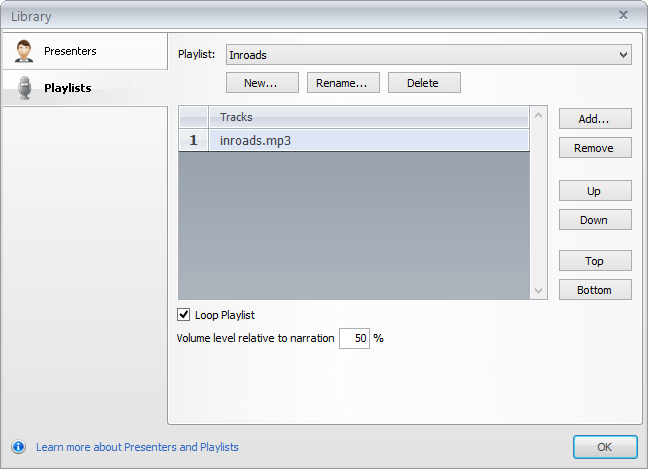 Deleting a playlist from your library won't remove it from existing presentations where it has already been assigned. It just won't be available for new presentations. However, if you delete a playlist that's assigned to one or more slides in the presentation that's currently open, it will be removed from those slides.